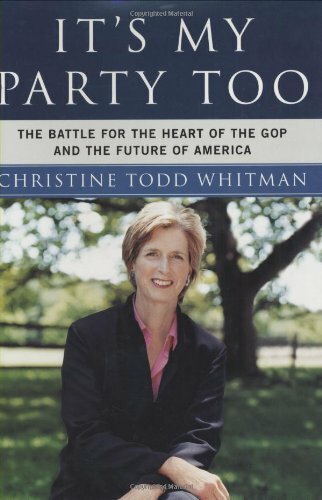 Christine Todd Whitman, the former New Jersey governor who was President Bush’s first administrator of the Environmental Protection Agency, has written a book that touts the importance of moderates to the future of the Republican Party and flays Bush and his team for ignoring the country’s middle. Whitman charges on Page 3 that Bush’s three-percentage-point margin in the popular vote is the lowest of any incumbent president ever to win reelection, the WASHINGTON POST reports in coming editions, newsroom sources tell DRUDGE. IT’S MY PARTY TOO: THE BATTLE FOR THE HEART OF THE GOP AND THE FUTURE OF AMERICA streets during inauguration week, insuring heavy media coverage. “The numbers show that while the president certainly did energize his political base, the red state/blue state map changed barely at all, suggesting that he had missed an opportunity to significantly broaden his support in the most populous areas of the country,” Whitman writes. “The Karl Rove strategy to focus so rigorously on the narrow conservative base won the day, but we must ask at what price to governing and at what risk to the future of the party.” Whitman details her many scars and frustrations in dealing with what she calls the “antiregulatory lobbyists and extreme antigovernment ideologues” that she suggests hold too much sway over the Republican party. This entry was tagged Christie Whitman, GOP. Bookmark the permalink.